At Safe-T-Cover, we receive numerous inquiries concerning Fire Department Connections and our insulated enclosures. As the fire industry and municipal water authorities continue to move away from the dangerous practice of below ground backflow installation, more and more dedicated fire valves are moving outdoors and above ground. With this continuous change, more designers and installers are realizing the benefits of Fire Department Connections which are installed directly at the enclosure. Why Do We Care About the FDC? Fire Department Connections are designed to provide sprinkler systems with supplemental water support, either through a fully installed sprinkler system or a standpipe system. Regardless of the internal design, the FDC provides an immediately accessible external means of getting water to an interior fire. In some rare cases like floods, hurricanes, and earthquakes, the utility supplied water can be interrupted, and the FDC may be the ONLY way to get water to a fire. Needless to say, the FDC is a crucial component to an efficient fire protection system, and the FDC location is critical. 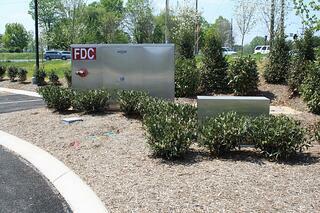 According to the International Fire Code and the NFPA, the location of the FDC is just as important as its operation. The FDC must be positioned on the street side of the building and be fully visible and recognizable from the point of view of the fire department vehicle. The location must allow for immediate access for fire engines and their hoses, with no obstructions. Most fire department connections end up on the side of the building itself. This is sometimes an acceptable placement - easily seen and accessed. That is not always the case, however, as you can see in the image to the right. Could a team of firemen in a fire engine easily access that FDC? Additionally, if that building contains a fire, it may not be safe for the firefighters to access that FDC. Think of a team of firemen driving up to a burning building - they need to find and access the FDC in a matter of seconds! They must be installed in an easily accessible location, with proper signage to instruct the firemen where the water will be going. At Safe-T-Cover, we believe one of the best and most efficient locations for an FDC is directly at the backflow enclosure. It gives you immediate access to the fire suppression system, it’s highly visible, and it is an accessible FDC location, as the maintenance of the internal valves has already been considered. In addition, the required FDC signage, instructional signage, and industry escutcheons can easily be installed on an insulated enclosure as you can see in the image to the right. Furthermore, the penetration of the enclosure to install the FDC can be performed on-site, which will assist the installing contractor, and also allow for retrofit applications. 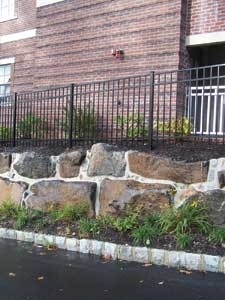 Penetrating the panel of an insulated enclosure is much easier than penetrating the side of retro-fitted building. 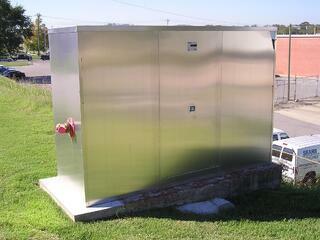 At Safe-T-Cover, these on-site augmentations will not affect the warranty of the enclosure. Here are more examples of fire department connections directly at the enclosure. Per the IFC and NFPA, they are fully visible, easily recognizable, and easily accessible. 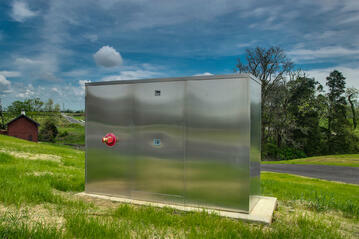 Safe-T-Cover believes that the protection of the water supply, property, and personnel are of the utmost importance. Installing an FDC directly at the insulated enclosure can assist firemen in suppressing a fire in a faster and more efficient manner. That preserves the property, houses, homes and the heroes who protect us all.